Trying to get your kids to eat their spinach (though you may not want to with the recent spinach problems in the U.S.)? 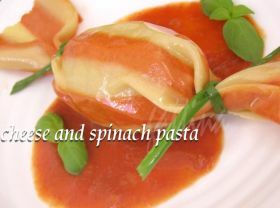 Why not try these cheese and spinach candy-shaped raviolis? By using two different colors of home-made pasta (one with semolina, the other with tomato puree), Gattina has created an irresistable yet healthy meal. I don’t know a single kid who could resist this fun dish! thanks for visiting my blog, and writing such a nice feature! Your blog is definitely an eye candy for me!